At OC Safety, providing people with the tools and techniques that they need to respond in emergency situations and save lives is what we do. From first aid and CPR classes to HIPAA training and ACLS Certification, our local Orange County, CA training center has a full range of courses for individuals, organizations, or medical professionals. As an OSHA approved and American Heart Association authorized training center, we are committed to providing only the best first aid training programs, which is why our on-site training is led by industry professionals, including registered nurses, firefighters, and paramedics. No matter what classes you choose to take with us, you will get hands on experience practicing the first aid skills you need to protect loved ones or strangers alike in a time of need, all in a comfortable, relaxing, and fun environment. Just check out some of our customer testimonials below! Tell Us About Your OC Safety Experience! At OC Safety, we are committed to constantly improving the experience for our customers here at our training facility, which is why feedback is extremely important to us! If you’ve taken first aid training or any of our other certification courses with us, we encourage you to fill out our online contact form to share your experience with us. 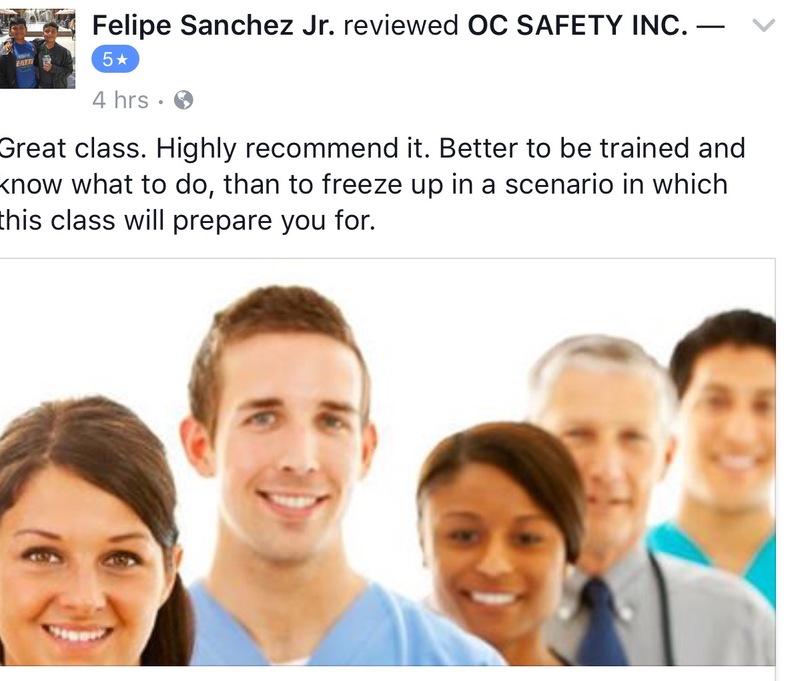 We look forward to hearing your feedback and continue providing nothing less than the best in first aid training to the Orange County, CA community! Sign Up For Your Training Class Today! If you’re looking to register for one of our first training or certification courses, just check out our calendar of classes. All you have to do is find the next available date for that class, click on it, and fill out the form with your information to officially register. For any questions about any of our programs, just contact us to speak with a member of our staff who will be more than happy give you the answers and any other information you may need. We look forward to seeing you at our center soon, and helping you prepare to respond to emergencies and save lives! I need to share this w/you. I completed the CPR / AED training just under a month ago, 1/11/16. Today I was hiking in Peter's Canyon and came across an elderly man who had collapsed with pain in his chest. There were 2 other hikers and the man's 20 yr old grandson. As Craig Robson had instructed us to do, I assessed the situation. The 2 hikers were actually nurses and were asking the man the pertinent questions and the grandson was just calling 911. The gentleman was sitting on a park bench, no shade in sight and it was approx. 89 degrees, I asked if anyone had offered water (due to lack of hydration which can bring on chest pain) and they had not. I had the grandson give his grandfather my water and he immediately said he felt much better. The grandson was confused and couldn't give our location to 911, so I assisted him with the exact trail and location and how best to reach us. I asked all involved to stay with the man and offered to hike back to the entrance to this particular trail to flag down the paramedics. While hiking back, I remembered passing County Maintenance workers, found where they had gone, flagged them down and informed them of the situation and where they needed to go with their truck to assist. Because of this, the county workers were able to unlock an access gate for the paramedics and fire truck which in turn saved time and confusion. They were able to assist the gentleman and took him to the hospital for treatment. Without my training, I would not have been able to stay calm and proceed with the correct procedures that i was taught. Thank you! Thanks again for coming out and teaching our staff. If you've enjoyed your experience with OC Safety, please let us know!